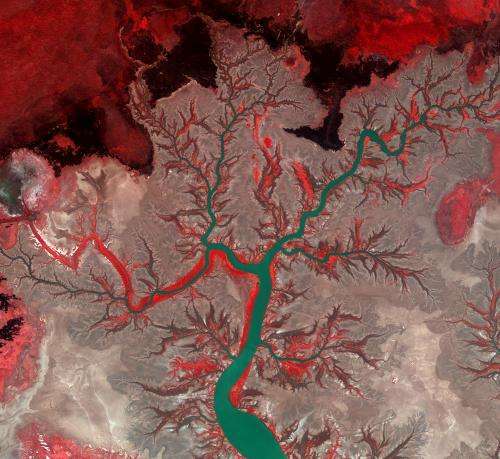 This false-colour satellite image shows the Kumbunbur Creek in Australia's Northern Territory, about 260 km southwest of the city of Darwin. The green 'branches' of what looks like a tree are the waterways of runoff that flow into the Timor Sea (not pictured). The false-colour makes vegetation appear bright red, and we can clearly see how vegetation grows mainly along the waterways. Vegetation is more evenly dispersed across the plain to the north. The image was captured by the Kompsat-2 satellite on 20 September 2011, near the end of the dry season. The dry areas with a somewhat dull colour in this image become flooded mudflats during the rainy season. The rainy season occurs during a tropical area's summer months because of increased heat from the Sun's more direct impact angle. Higher temperatures lead to an increase in evaporation and rising, warm air masses. This air expands and cools, leading to the formation of cumulus clouds, and almost daily rainfall and thunderstorms. As seasons change, the location of these rainfalls travels to areas with the highest Sun impact angles, resulting in wet and dry seasons in different zones of the tropics. The tropics are the region of Earth north and south of the equator. Some areas of northern Australia are part of the tropical climate zone.